Your office is jam-packed with boxes of marketing supplies, years of old files, and maybe even some unused equipment. You have considered moving to bigger digs, but the cost of relocating your entire business isn’t something your bottom line can handle right now. So, what are your options? Have you thought about renting a storage facility to help clear out some space? Is a Storage Unit the Answer? What Will You be Storing in the Unit? Is your office overrun with paperwork? Businesses must keep hard copies of files for years; which can take up space. A long-term storage unit can be a great place to keep rarely used files out of the way. Or maybe you host several annual events that require large signage, tables, and other marketing materials. There’s no need to clog up your office closets with items you only need to get your hands on periodically. Seasonal businesses may also benefit from renting a storage unit. 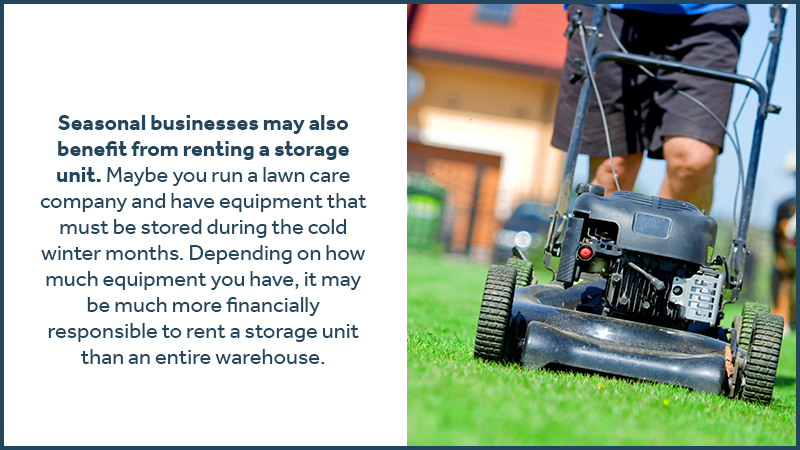 Maybe you run a lawn care company and have equipment that must be stored during the cold winter months. Depending on how much equipment you have, it may be much more financially responsible to rent a storage unit than an entire warehouse. The smaller the area needed, the more likely it is a storage unit will make more sense. For instance, if your office space is sufficient for your staff and customers, but simply lacks enough room for files, marketing materials, and extra inventory, then it may make more sense to rent storage space than move the entire business. But, if you find yourself renting several units, it may be time to look for a larger office. Run a detailed cost analysis to see which option is best. How Often Do You Need to Get to Your Stuff? Let’s be practical here. If you need to store items that your staff will need on a regular basis, then a storage unit probably isn’t practical. But, if you need space to keep seasonal inventory, extra supplies, and periodic marketing materials, then it could be the best solution to emit your needs. When it comes to running a business, the cost is important. Be sure to carefully calculate the cost of renting a larger work space versus a storage unit. Accessibility: you have to be able to get your hands on your items when you need them. Be sure that you have easy access to your unit – and your items – that is convenient for your business. Security: what type of security does the company offer? Will your files, equipment, and inventory be safe? What about storm safety procedures? What type of storm security is offered? Who is responsible for getting the unit ready for a weather emergency? Climate: is the unit climate controlled? Will your items be stored indoors or outdoors? Are the units protected from hot and cold temperatures? 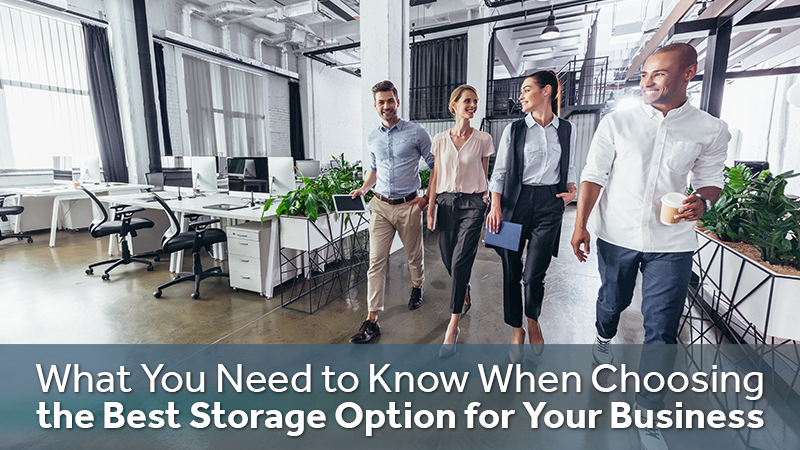 There is a lot to consider when choosing the right storage solution for your business. That’s why you need the team of experts at Zippy Shell – to help you make the right decisions. Contact Zippy Shell Moving & Storage Today And Let Our Storage Experts Help Keep You And Your Business’ Belongings Safe!